Sunwing Airlines has started its Toronto to Tobago service at a critical time for the island given its recent rebranding exercise and attempts to increase visitor arrivals. 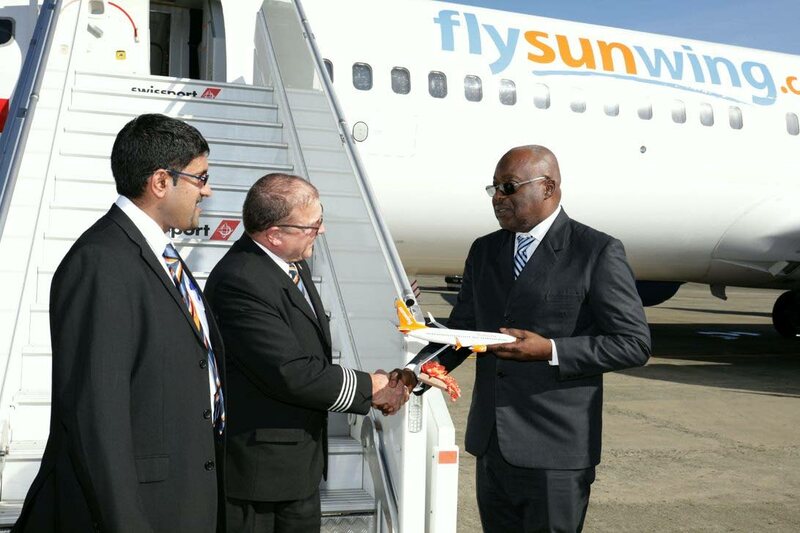 Chief Secretary Kelvin Charles, speaking at the arrival of Sunwing Airlines inaugural flight, WG175, last Thursday from Toronto’s Pearson International Airport to the ANR Robinson International airport in Crown Point, also said visitor arrival numbers Tobago are showing growth. “This addition opens new gateways to Tobago as we continue to strengthen our endeavours through our go-to strategy to increase airlift to Tobago and grow our international visitor arrival numbers in our key source market and more importantly to improve on island spend in the destination,” he said. “The arrival of Sunwing Airlines comes at a time when our international arrival numbers have begun to show positive growth, as marginal as that might be. International air arrivals in 2016 was 20,101, in 2017 it was 25264 and in 2018 as of November 30, arrivals are already at 35,405. “The growth in arrival numbers is good news for Tobago as it represents a myriad of opportunities for our tourism sector where residents can interact with visitors and leave a lasting impression on them. The onus is on us as Tobagonians to inspire our visitors to return or at least share their positive experience with others so that they may be encouraged to choose Tobago as their next vacation destination,” he added. He encouraged the visitors to make the most of their stay by exploring and experiencing what Tobago has to offer. “This once a week non-stop service from Canada operated by Sunwing Airlines is a significant new partnership and is indeed a landmark achievement for Tobago. “It is the first time in the history of airline operation here at the ANR International Airport that a Canadian airline has landed on this beautiful strip of runway, providing a direct flight service. This service is very important for the development of our tourism sector and has been one which our stakeholders have been advocating for, for a very long time,” Charles said. He said the service would provide more options for visitors to choose a destination as well as for residents of Tobago. Also present at last Thursday’s event were Chief Executive Officer of the Tobago Tourism Agency Ltd ((TTAL), Louis Lewis and Canadian High Commissioner Carla Hogan Rufelds. Passengers were treated to a culturally infused welcome reception hosted by TTAL that included live musical and dance performances, Tobago-themed refreshments, and commemorative "Tobago Beyond" tokens. Sunwing Airlines is utilising a Boeing 737 with a capacity of 189 passengers. It will operate once weekly direct flights from Toronto’s Pearson International Airport to Tobago on Thursdays until April 18, 2019. The airline also brought 200 backpacks of school supplies and gently-used books as part of Flying Start Programme, a charitable initiative of the Sunwing Foundation to aid in educational endeavours of children across destinations served by the airline. The backpacks are to be distributed to children between the ages of 5 and 12 years at a Christmas for Special Kids’ event to be hosted by the Mason Hall Empowerment Group in collaboration with the Peters Family Foundation which provides support to parents with differently abled children on the island. Reply to "Charles: Sunwing opens gateway to increased airlift"